As you all may know, this is my first year celebrating Child Life Month as a Child Life Specialist! Very exciting!! However, I am the only CLS in my department so it’s really up to me how I decide to celebrate Child Life month (no pressure, right?!). Being that I started working in January, I am still too shy to go all out and make shirts, organize a flash mob, create games with prizes, call the news stations, etc. So, here’s what I’ve done! – We have a bulletin board in our staff bathroom which needed a little tlc so I (with the help of some fabulous nurses that are very excited for Child Life month) fixed up the bulletin board & added a fun little Child Life info sheet which I’ll change weekly for the month of March. The info sheet includes: child life tip, did you know…?, get to know your child life specialist (2 truths & 1 lie about me), & a favorite child life quote. – I was also able to gain custody (for this month at least) of a bulletin board in a high-traffic area in our unit! I dressed it up with “Lucky to have Child Life” (idea inspired by a post on the Child Life Council blog) & a “who, what, when, where, & why” about child life (info from the Child Life Council as well). – I wanted to do a little more so I met with my boss to see what she could help me with to celebrate Child Life month & I was able to write a post for the monthly newsletter and have food ordered for the staff on a date of my choice. Not too shabby for a first timer, if I do say so myself! The staff in my ER is great and really supporting my role as a CLS. From doctors and nurses giving me excellent referrals, to staff members asking if they can help me bag crayons or clean toys, to even brainstorming child life month activities! I may be the only cls in my department but I’m definitely not alone :). 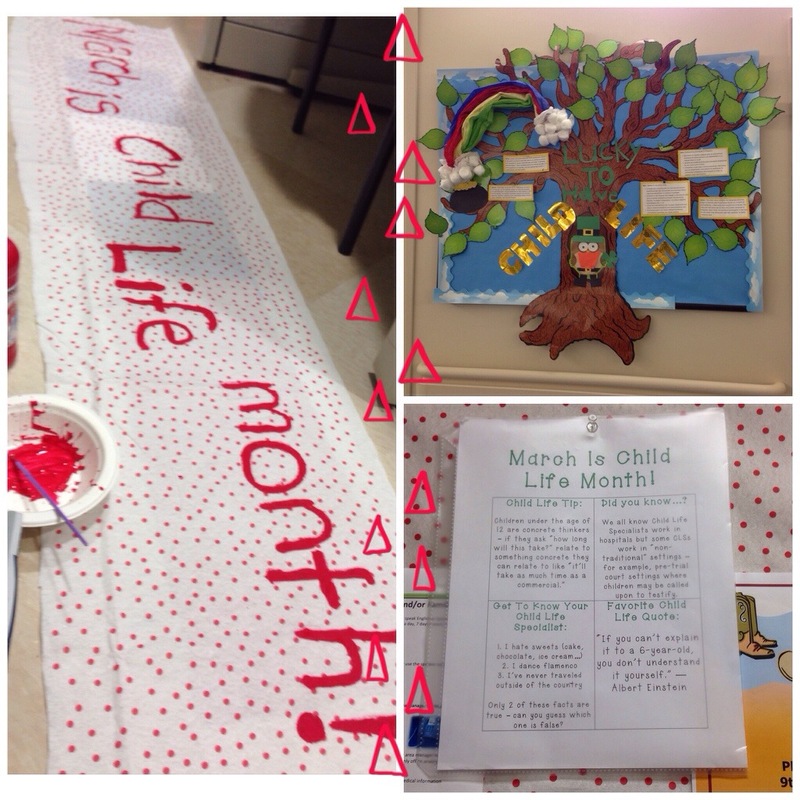 Glad to hear that your first Child Life Month within your department has been such a success. Kudos to you and your supportive interdisciplinary team! We just shared a link on CLC’s Pinterest page. Keep up the great work!